About Princeton Public Library: The Princeton Public Library, located in Princeton, New Jersey, is the most visited municipal public library in New Jersey with over 860,000 annual visitors who borrow 550,000 items, ask more than 83,000 reference questions, log onto library computers over 90,000 times, and attend more than 1,300 programs. 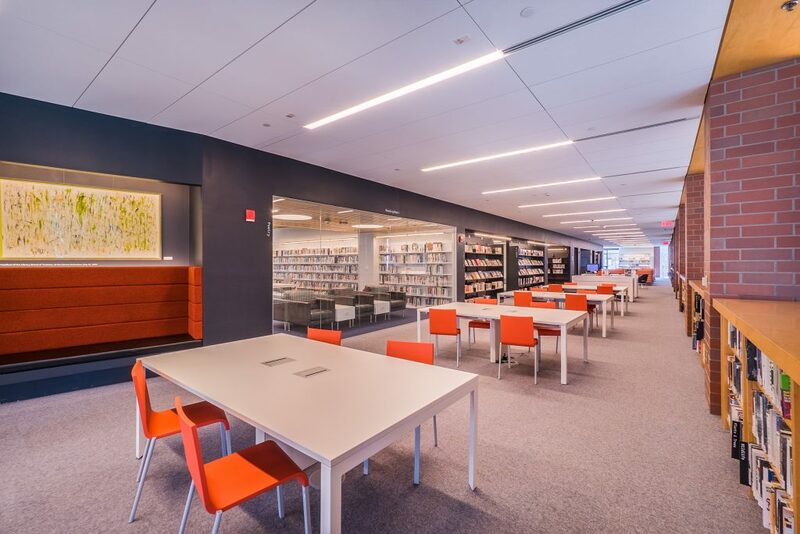 When Direct Flooring decided to take on the massive flooring project at Princeton Public Library, it was decided the library would not close but remain open during the renovation process. 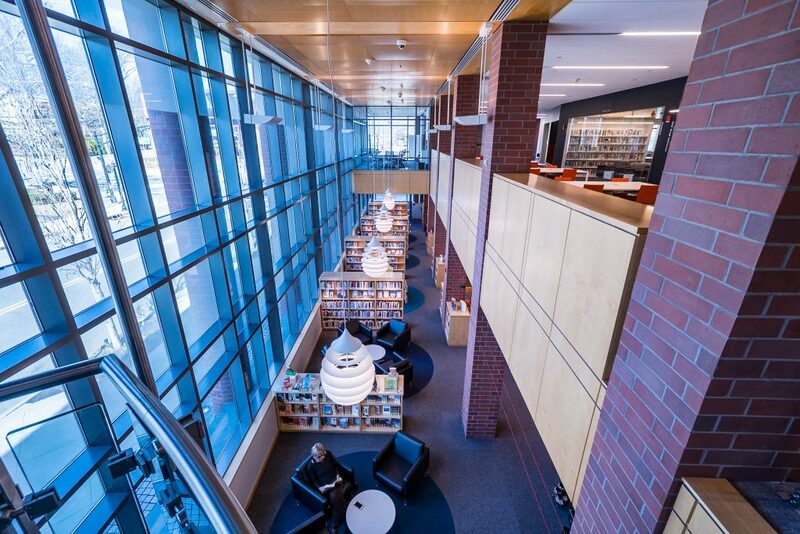 Logistically, the three-story Princeton Library offered unique challenges not many other flooring companies are equipped to handle. 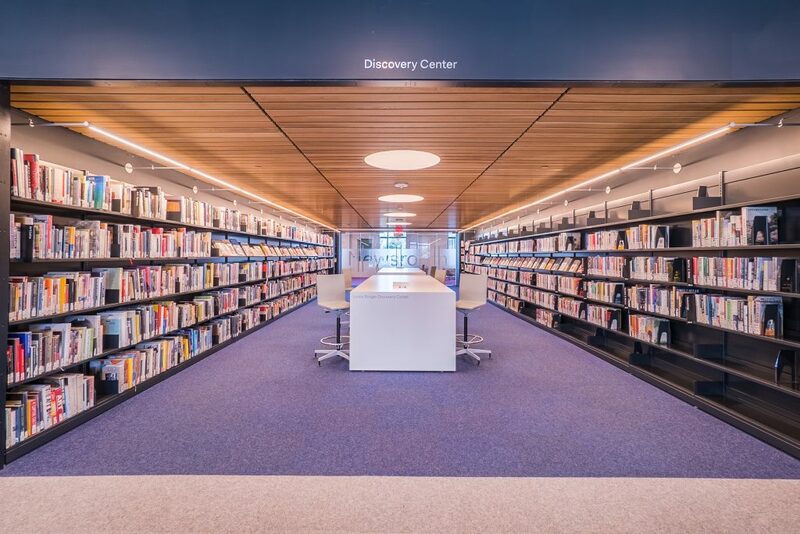 Like other previous public libraries that Direct Flooring has contracted, Direct Flooring was tasked with the breakdown of all the existing book shelves, re-positioning the shelving areas into the new space layout and re-cataloging over 100,000 books. The coordinated dance of construction and flooring installation involved layers of project management in addition to providing great flooring throughout the library. When you work side by side with the largest library in the State of New Jersey, nothing is left to chance. 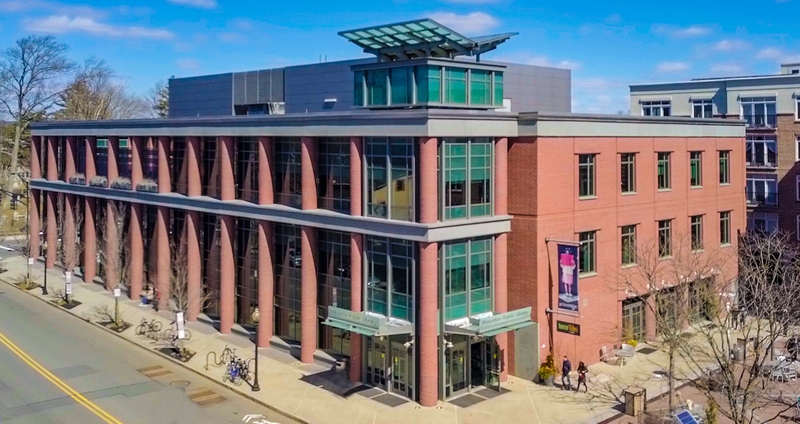 The wool blend utilized for Princeton Library was selected for its long life and unique wear and tear properties. The carpet tiles use mixed patterns and colors in specific areas which create a contemporary vibe throughout the space. In the children’s area for instance, a circular pattern was used so children can gather inside the circle. In private reading areas, circles and rectangle patterns featuring bold colors and patterns were mixed in to create excitement in certain locations and a calming effect in other locations. As visitors explore each floor of the three-story space, their senses are filled with a perfect blend of designer effects including wall colors, ceiling patterns, brick work, and walls of glass; all of which perfectly coordinate directly with the flooring patterns. In this case, the design team benefited when a wide variety of choices are presented and a full array of color pallets were available from Direct Flooring. Direct Flooring, Flemington, NJ has been a leader in the flooring industry since 2005. They offer all types of flooring from every corner of the globe. Direct Flooring can help you select the best products while tackling the most challenging installations. Our customer service is second to none. For more information, click directflooringmetro.com or call 908.237.1009 and speak with one of our flooring specialists. Direct Flooring is in Flemington, NJ and services all of NJ, New York City’s Metro area and Eastern PA.